Lorikeet Bushy Tree Mandala (detail). Emily Crockford, Studio A. Mural in Westpac Service Centre, Concord West, NSW. Photo: Jessica Leggett. 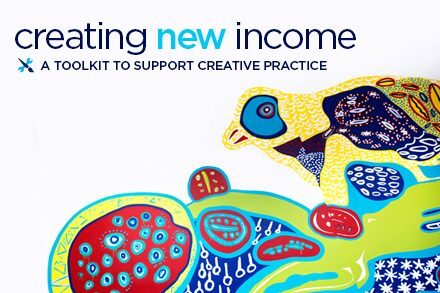 Welcome to the Create NSW Creating New Income: a toolkit to support creative practice. Here you’ll find guides and resources to help generate revenue for your creative practice. The Toolkit is tailored to creative practitioners and small to medium organisations. We’ve taken a “how to” approach to each topic, showing the steps needed to grow and develop income streams from sources such as philanthropy, sponsorship, crowdfunding and new products. Individual guides contain links to related information throughout the Toolkit and case studies of success from around NSW. Alongside each of our guides you’ll find links to further resources sourced from around the web to help kick-start your fundraising efforts. If you have any questions or comments on this toolkit, please email mail@create.nsw.gov.au. NESTA has just released Funding Innovation: A practice guide. This guide shares the funding tools Nesta has used to support innovation and offers practical advice on how to make money work harder using a range of financial approaches, including stage-gate grants; matched funding grants; challenge prizes; impact investment etc.